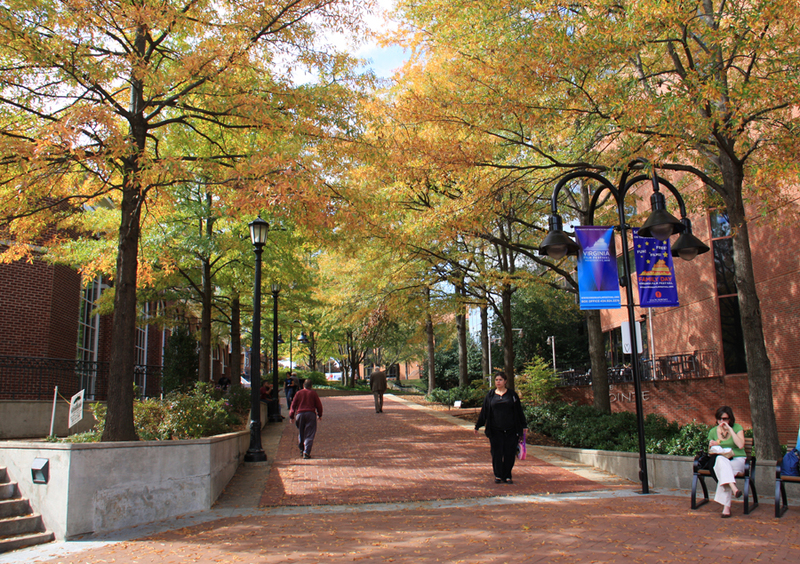 Autumn is almost upon us and it is a lovely time to visit Charlottesville. 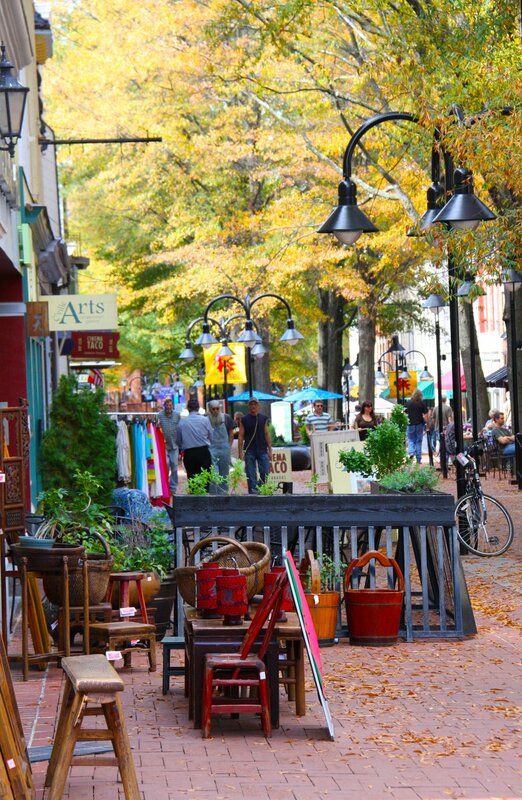 With beautiful foliage, cooler temperatures and the bustle of the University of Virginia starting a new year, our city’s hub for dining, arts, shopping and, of course, people watching is more vibrant than ever. 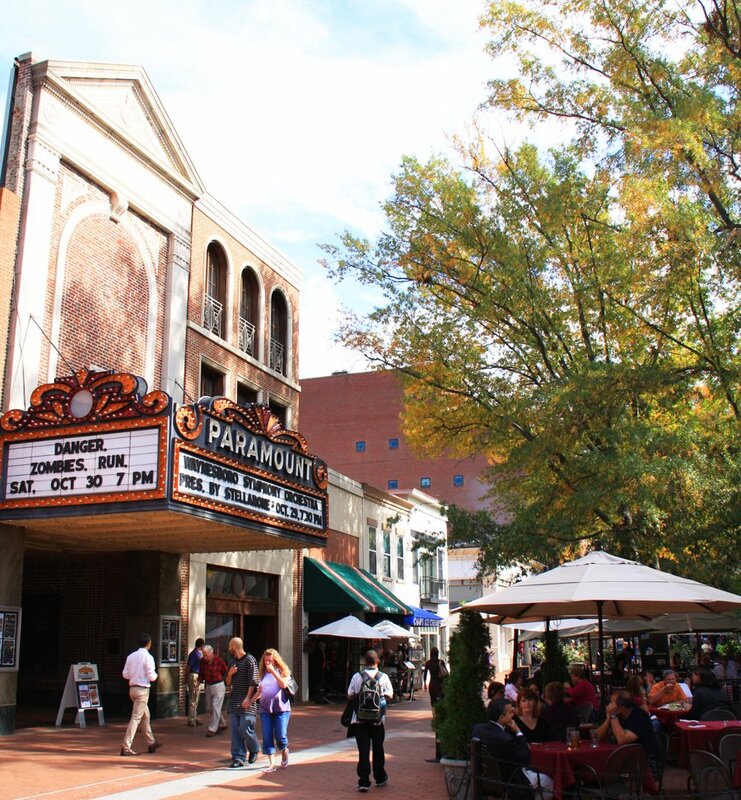 One must-visit destination in the fall is Charlottesville’s Historic Downtown Mall—a staple in our city. With historic buildings, performance venues and theaters, local restaurants, shops and attractions, there is much to enjoy along the pedestrian mall. While this outdoor mall is one of the oldest of its kind, it is actually relatively new to Charlottesville, which was founded in 1762. Scroll on to learn a little about the history of our beautiful mall from Purple Cherry Architects and for some things we suggest you do and see when you visit! When the creation of a pedestrian mall became the topic of conversation in Charlottesville between the 1950’s and the 1970’s, the goal was to revitalize the downtown district. After more than 20 years of conversation, the City finally decided to close off five blocks of Main Street and transform the section into a pedestrian mall. On February 8, 1975, the City began construction with the Market Street Parking Garage and a year later, they officially began blocking traffic and working on the mall. Architect Lawrence Halprin was chosen to design the mall. Recipient of the University of Virginia Thomas Jefferson Medal in architecture, Halprin utilized a number of features to create the city center visitors enjoy in this now successful pedestrian mall. From planning bricks and pavers at varying scale along the ground, to lined trees and lampposts at a ceiling level height, every last detail was planned for a comfortable experience. However, it took over 25 years for the mall to become the life center of Charlottesville. Prior to its current success, the City implemented multiple modifications of the original design including vehicular road crossings and small side street expansions. In 1983, the City itself even invested in building a $20 million Radisson hotel (now the Omni Hotel) at one end in the hopes of energizing the area. Eventually, once mall parking and access were managed, people began to frequent the “pedestrian” street. Restaurants and cafés started putting tables outside and great meals and drinks became available to enjoy under the mall’s interior tree canopy on warmer days. Mom & Pop shops “popped” up along the street with specialty and unique items. Today, you will not see a Hard Rock Café or a Barnes & Noble Bookstore on The Downtown Mall. The shops are all local—some with histories as old as the buildings they occupy, like the New Dominion Bookshop (established in 1924) or The Paramount Theater (established in 1931). Any endeavor needs time to be successful. It may have taken time to plan, time to build, and time for people to realize that change can be a good, but today the Charlottesville Historic Downtown Mall is one of the longest pedestrian malls in the country and continues to attract visitors with its charm, history and unique offerings. Looking for ways to make the most out of your visit to the Historic Downtown Mall? Here are a few ideas! Visit one of the stunning historic theaters, like the Jefferson Theater and The Paramount Theater. Tip: The Paramount Theater occasionally offers tours if you do not have tickets to a show! Attend the Charlottesville City Market (a local farmer’s market held beside the mall) on Saturday mornings. Shop unique gifts, books, antiques, clothing, accessories and more at one of the over 120 quaint shops! Write a message on the chalkboard wall on the eastern end of the mall. Are you a Dave Matthews Band fan? Be sure to visit Miller’s, the restaurant/ pub where Dave Matthews used to work in the 90s. Enjoy visiting one of the attractions. Tip: If you have children, the Virginia Discovery Museum is great for children through the age of 8. Grab a cup of local coffee or sweet treat to enjoy while you stroll the mall. Choose one of the over 30 stellar restaurants for a bite to eat. Enjoy a concert or show at one of the music venues, like The Southern Café & Music Hall or the Sprint Pavilion. Tip: Visit in the evening on the first friday of the month for “First Fridays,”— a monthly art event that includes exhibition openings and receptions at many of our local art galleries. Stop and listen to a street performance. Catch a movie at the Violet Crown Cinema or The Paramount Theater. Make a wish and toss a coin into the water fountain on the western end of the mall. Make it a weekend at one of the local hotels or inns!